I’ve been making flax crackers for years and am always amazed at how fool-proof it really is! The only 2 essential ingredients are flax and water. You can use your imagination to explore endless variations on this simple cracker. You can blend greens into it, flavor it with seaweed or spices, or add finely chopped veggies for a chunkier texture. Crisp and thin, with a nutty flavor profile and aroma, these raw vegan crackers are chock full of healthy fates and protein. 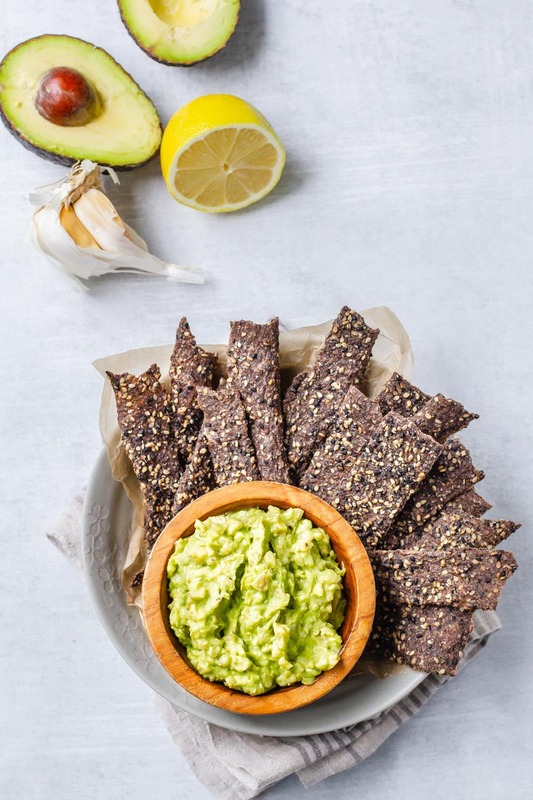 They hold up well with a whole range of dips including hummus and guacamole! One important note is to make sure you are using ground flax rather than whole, as flax is much more digestible when ground. Whole flax seeds will pass right through your system without the precious and beneficial oils and nutrients being absorbed. 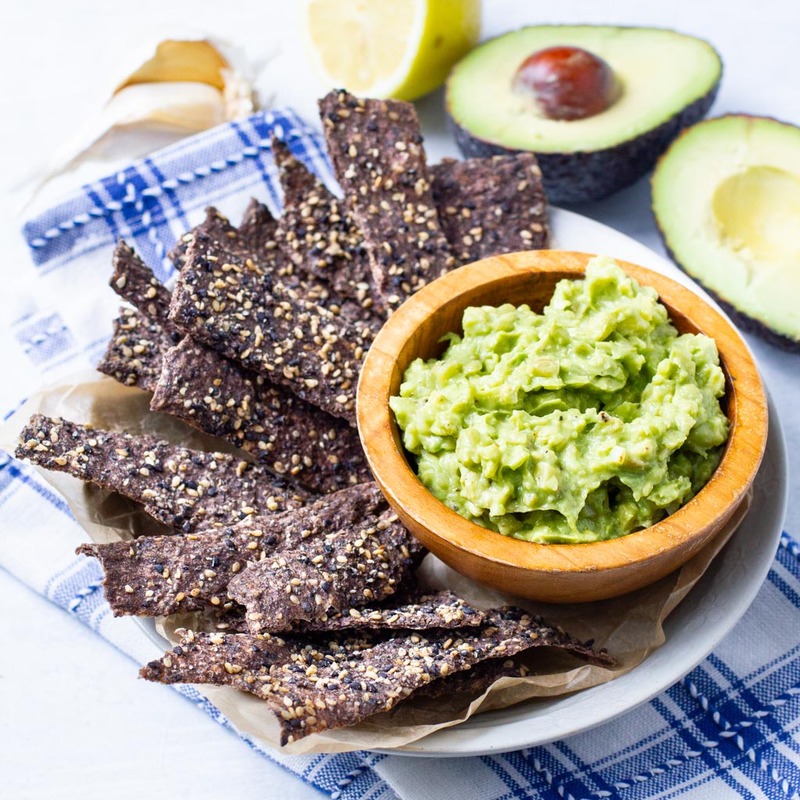 Crisp and flavorful sesame & flax crackers are great with any dip or even to make a raw vegan sandwich! Grind the dry whole flax seeds in a blender until you have a fine meal. Transfer to a medium mixing bowl and add the water, chia seeds, sesame seeds, dulse flakes and sea salt. Whisk well until completely combined. Allow to sit for 1 hour and then whisk again. Prepare your dehydrator sheets by wrapping them tightly in plastic wrap or using a solid non stick sheet. Divide the flax mixture onto 3 separate, lined dehydrator sheets. Spread the flax mixture into a thin layer over the dehydrator sheets using an offset spatula. Place the dehydrator trays into the dehydrator and set the temperature to 115. Dehydrate for 4 hours. After 4 hours, remove the trays from the dehydrator and flip the crackers over on the tray, and carefully remove the plastic liner. Place the trays back in the dehydrator and finish dehydrating for another 8 hours at 115 F.
Store in your pantry in an airtight container.